In "The Cowboy and the Canal," J.M. 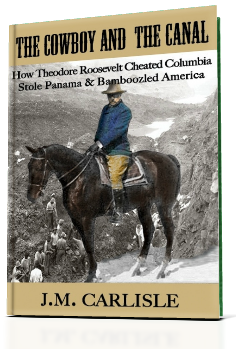 Carlisle masterfully provides compelling evidence for the true reason behind Roosevelt's decision to build the inter-oceanic canal in Panama (hint: it's not because it was the best location). The book is organized chronologically, beginning in 1513 with a background on the location where the Panama canal would be built many years later. Carlisle continues to give a tremendous amount of historical context for the canal decision throughout the book, delving into the motives of each of the "characters" who had a role in the decision. The information is well-organized and presented logically. There are also historical images, illustrations, etc that complement the text nicely. By the end of the book, you will, at the least, be questioning your notion of TR. Overall, an incredibly well-written book that will engage anyone who is even remotely interested in history.